The United States put themselves in a solid position to advance from Group A with their largest-ever victory against Costa Rica. If you want to read a story about how the US dug deep after a listless performance against Colombia and produced something totally different against Costa Rica, you should read Aaron Timms’s piece for The Guardian. It’s well-written, and captures the views of a lot of people on the game. For me, the game had many continuities with the loss to Colombia (it helps that my assessment of that game was more positive than some others). The most obvious continuity was the starting XI, the first time Jürgen Klinsmann has used the same line-up in consecutive games since a the final pre-tournament warm-up and the first game of the World Cup. The only real difference was that the US midfield was able to spread out into a triangle from the outset. For Costa Rica, manager Óscar Ramírez was forced to bring in Francisco Calvo for suspended center-back Kendall Waston, but also replaced defensive midfielder Yeltsin Tejeda with winger Christian Bolaños, shifting Costa Rica to a 3-3-1-3. Bryan Ruiz moved freely across the attacking line from the “1” spot, and because Joel Campbell and Bolaños were fairly deep, the formation sometimes looked like a 3-5-2 with Ruiz as a second, withdrawn striker. The other notable difference from Costa Rica’s first game was Johnny Acosta’s positioning in front of the other center-backs, perhaps to help support Celso Borges in midfield. Costa Rica were definitely the more threatening side to start the game, but this time the United States earned an early set piece goal rather than giving one up. Bobby Wood was clearly pushed down in the box, and Clint Dempsey’s penalty kick put the US up against the run of play. Many commentators have suggested that the United States controlled things from here on, but in my view Costa Rica remained the more threatening side despite the early substitution of an injured Marco Ureña by Álvaro Saborío. Not unlike the US against Colombia, they dominated possession and penetrated the attacking third without being able to produce serious chances at the final moment. They remained the better side for the first third of the game, up to a series of 3 counter-attacking chances from the US that started at 33′ and culminated in Jermaine Jones’s 37′ goal. In fact, even as the United States was taking control of the game, Costa Rica managed a dangerous 35′ attack down the left flank that ended with the ball in Brad Guzan’s hands at the near post. 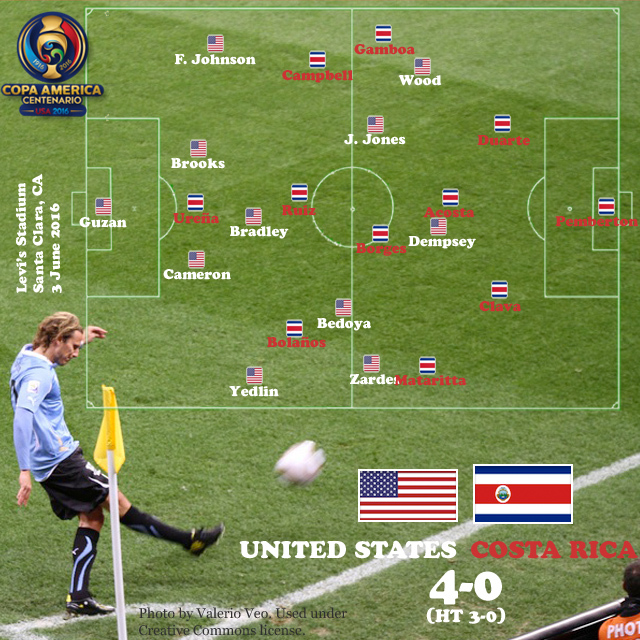 Following the second goal, Klinsmann shifted the United States into a 4-4-2, Wood joining Dempsey up top and Alejandro Bedoya sliding out to left wing. The change (which against Colombia had been introduced to chase the game) caught Costa Rica unawares, and Bobby Wood hit a fantastic striker’s goal to put the US comfortably ahead going into halftime. Costa Rica adjusted to the change in the second half, replacing their entire right flank (including a very poor Campbell, whose role was taken over by Bolaños) and bringing on central midfielder Randall Azofeifa to shift into a more possession-oriented 3-4-3 (Ruiz moving out to the left of Saborío). They again dominated possession against a United States team that was content to sit back, but which was now also outmanned in the middle of the pitch. But Costa Rica’s chances still foundered, and they already looked defeated by the 70′ substitution of Graham Zusi. He replaced Bobby Wood, allowing the more energetic if less talented Gyasi Zardes to move up top and getting a legitimate winger onto the right flank. Zardes’s pressing was immediately effective, and at 87′ Zusi was able to strip Calvo and score a final goal to strengthen the US goal difference. While the result was much more pleasing for US fans than the Colombia game, I’m not sure the play was significantly better. Here our chances fell and Costa Rica’s didn’t, and especially once you factor in the quality gap between Colombia and Costa Rica, I’m not sure how much difference can be drawn between the two performances. Certainly, Colombia’s sparkling game against Paraguay, especially that of James Rodríguez, suggests that the United States deserves more credit than they got for containing the fluid and challenging group leaders. Paraguay remain a serious threat to US chances of advancing, and that game will now clearly determine the final assessment of Klinsmann’s side in this tournament.